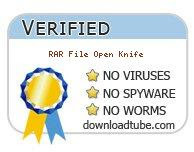 My new Windows utility "RAR File Open Knife - Free Opener" (1.4MB, Freeware) has been reviewed and recommended by downloadtube.com: "RAR File Open Knife is intuitive to use and has a simple interface. Just select the output folder and it will do the rest. It features support for password protected archives. The program is very fast featuring a highly optimized engine to match its competitors..."